Digital literature is a relatively new but fast-evolving medium with exciting possibilities. To give the public the opportunity to read and interact with a variety of types of e-literature, the Reading Digital Fiction group – led by Dr Alice Bell of Sheffield Hallam University – held ‘The Future of Reading?’ exhibition in Sheffield last November. For this, the group requested the help of our IT Support team. We helped them plan a reliable way of exhibiting the works to the public and installed it in the Bank Street Gallery. 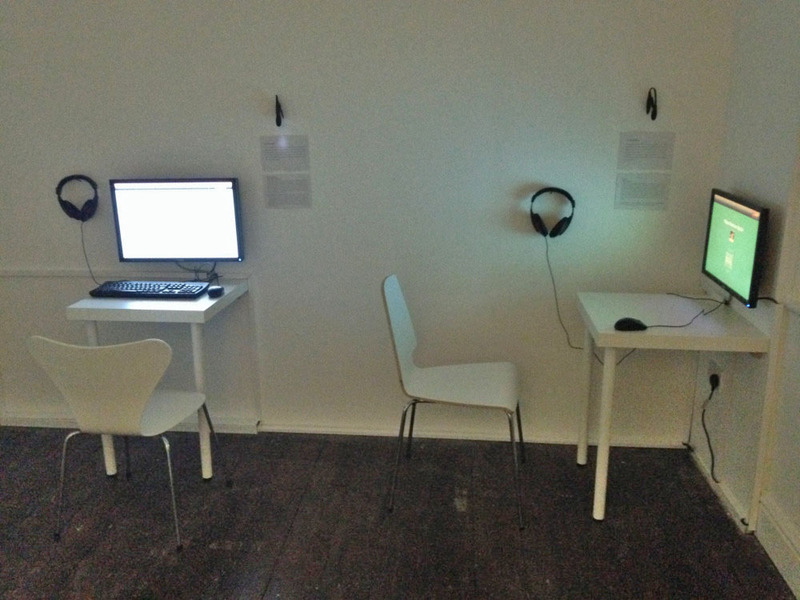 The exhibition’s modern examples of Digital Fiction needed a minimalist approach. We mounted a simple monitor with headphones on the wall and positioned a keyboard and mouse on a table at the side for people to interact with. To protect the various pieces of fiction, we installed specialist kiosk software so that no one could tamper with the exhibited works. Surprisingly, digital fiction isn’t all about computers. On display too were early, non-digital, non-linear examples of literature such as ‘Books in a Box’ (like The Unfortunates) for the public to see. Books in a box encourage people to read the pages of a book in random order, to give each reader a unique experience. Later, popular adventure books gave readers key decisions which shaped the stories’ endings. Storytelling of this kind made its way into the digital domain as home computers became common. We therefore helped D&S set up older computers, like the Atari 800 running Zork, which they’d sourced from museums around the country. IS&T staff were also available during the exhibition to give support in case there were any issues. The research project is on-going and another exhibition is scheduled for November 2015. Dr Bell is again looking to IT Support to help plan this – and another imaginative set up will be required. The idea is for a PC connected to three projectors, edge blended, to give an immersive, interactive experience. Check out the Reading Digital Fiction blog to see pictures of the exhibition and read about its impact.